Why didn’t you buy an iPhone 4 ? I seriously did consider buying the new iPhone 4 on the day of release. I am still in two minds about buying the new iPhone now, or waiting until my contract ends. Yes it has some great new features that I would like to see and try like the new camera; however part of me is thinking is this just because it is shiny or something new and different! What about the reception left hander issues? Personally I think, yes there may well be an issue, but is it really worth all the column inches that have covered this? There may be a design flaw, but all devices have design flaws, doesn’t mean they don’t work most of the time. My Google Nexus One for example, if it gets too hot (from being on for too long and doing stuff) the touchscreen stops working! My old LG Viewty kept turning itself off and the only way to turn it back on again was by removing the battery! Where was the Guardian and BBC on that issue? Of course the iPhone is selling really really well. Some estimates say 1.5million of them have been sold. So that any flaw in the design is going to impact on a lot of people, a lot more people than the flaw in the LG Viewty! That’s probably the reason behind the column inches. I do like that even though we have moved from analogue newspapers to online news sites, the term “column inches” still works. Thought I suspect a lot of people might think “inches” what are “inches”? Wonder what the metric or European term is for “column inches”. Anyhow even with the reception issue, I don’t think that would stop me buying one. I have already installed iOS4 on my iPhone 3GS and am finding it useful. I like the rotation lock. I like the quick App switching. Folders I am less keen on, but they do mean I can now see all the Apps on my iPhone, whereas before some were off the screen at the end! I like the spell checking (this is also on the iPad) and as someone who can’t spall it’s grteat! Not at all impressed with the digital zoom, but then I have never been impressed with any digital zoom. Less impressed with the home screen wallpaper, the first one I tried made the whole phone look cluttered… The Nexus One does seem to do this much better. Keyboard support may be useful in some instances, I do do a lot of writing. So what will the iPhone 4 hardware provide that is so “essential”? Facetime sounds great, but really we have been here before. My old Nokia N73 had a front facing camera and could do video calls over 3G. Well actually I never did do video calls, the main reason was that no one I knew did video calls, so I never had one. Also when I got the N95, I tried to call myself to just see how it worked, and it never worked! Facetime only works over wifi, if I have wifi I probably have a laptop or my iMac so I would be more likely to use Skype. Another big reason I wouldn’t use Facetime, is that very few people I would call in this way would have an iPhone 4. Like the idea, but can’t how it would benefit me at this time. Should I be buying two iPhone 4s then? No I think not. I do like the concept of the retina display. I really like the display on the Nexus One which is sharp and looks great. The 3GS has a 480×320 resolution, the Nexus One has 800×480. The iPhone 4 has 960×640 which is to be honest incredible for the size of screen, but is not that far off the Nexus One. It would be interesting to compare all three. I do like doing video, and though many phones I have had, can do video, none have really got there. The Nokia N95 which took great images had an okay video camera, but not fantastic. This video was taken with the iPhone 3GS and is actually not bad, certainly much better than the N95. If the video on the iPhone 4 is as good as the video that is been shown on the web, then I would be impressed. I also like the idea of the iMovie App. I must remember though I have ReelDirector on my iPhone, I have only used it once or twice in anger! I do like the idea of a 5MP camera, as I do use my camera a lot on the iPhone 3GS for taking images (in the main for uploading to TwitPic). Of course 5MP is nothing new, I did the same for many years with the Nokia N95. No idea if the battery life is any better, the stats indicate it is, but I suspect that this may not reflect actual usage. 6 hours on 3G doesn’t really cut it for a full day in London at a conference and for the train home. So at this time, I am in two minds about the iPhone 4. I think I would like one, but whether I would really like one right now, I don’t know. 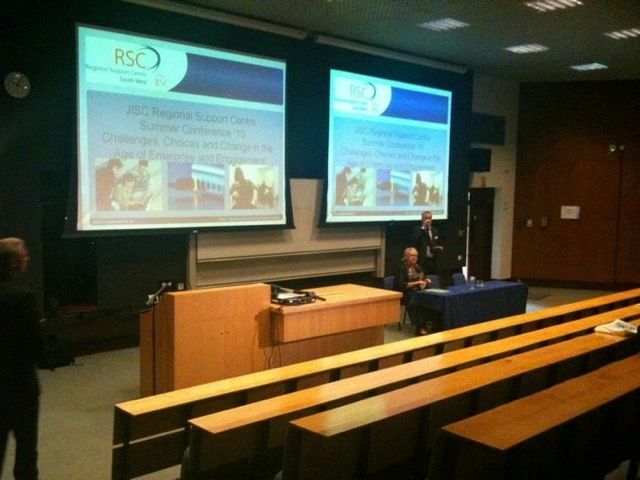 Last Thursday saw me venture down to the University of Exeter for the JISC RSC SW Annual Conference. I have been to all of the conferences and presented at many of them, keynoting at last year’s with David Sugden. This year I was just a normal delegate, which was nice and different. I rarely go to conferences as just a delegate these days. I also took the chance to try out just using my iPad as my main note taking, blogging and twittering device. It worked out just fine as you can read here and here. Following on from my earlier blog post on using the iPad at a conference I can see the iPad now replacing my laptop at these kinds of events. For longer events such as ALT-C or Handheld Learning I will take my laptop with me, but leave it in the hotel room so that I have use of it in the evening for video editing or audio editing. I didn’t get much from the two opening keynotes, they were interesting, but didn’t in my mind inspire me to change my practice. Others though did find them more inspiring. The opening keynote talked about the enterprise culture at the University of Plymouth and how it was changing what they did. The second keynote was on Business and Community Engagement, which was by JISC. The first session I attended was on Social Enterprise and how many business organisations now have a social motive over a profit motive. The second session was from JISC TechDis on engaging with SMEs. Gloucestershire has a large number of SMEs compared to somewhere like Bristol and often they can not “afford” to send their staff on training and staff development. In an interesting discussion we looked at the issues and challenges facing SMEs in the South-West and how FE providers (and others learning providers) can engage them and use technology to meet these challenges and break down invalid assumptions. One of the key conclusions was that there are cultural barriers both in the SMEs and in learning providers that need to be broken down before we can really provide solutions. After a good lunch and lots of networking, it was time for the afternoon sessions. I (with a little reservation) attended the session on Second Life by Bex Ferriday from Cornwall College. She gave a very entertaining and informative trip through Second Life, lessons learned and some really good ideas on how to use Second Life for teaching and learning. I liked the idea of how it can be used with some groups to break down barriers and enhance communication – and once Second Life goes browser based I think this could see much more use being made of Second Life. I also liked the idea of the underwater art gallery that contains student art that couldn’t exist in real life. After more tea, it was Vicky Weavers from Weston College and their VLE Bronze, Silver and Gold standards. In many ways their standards are similar in concept to the five stage VLE model I put forward in an earlier blog post. One aspect of their model I did like, was that you only gained the standard if learners actually used the VLE. What I was also interested in was the implementation, the carrot and stick approach. Weston College like most had tried the softly softly approach with limited sucess. The enthusiasts had certainly used the VLE effectively, but the use was sporadic and whole areas were not using the VLE. The college did feel, from student feedback, that access to online resources and learning was a “student entitlement” and that provision of such was patchy and lacked consistency. By using a combination of clear standards, senior management, quality, other college processes and importantly middle management; the college was able to increase use of the VLE by staff and to increase use of the VLE by learners. Some good ideas to take away. I then popped to see the Futurelab demonstrations, some nice new technology there. The final keynotes were on cloud computing, specifically Google Apps. I can see many FE Colleges moving over to Google Apps as a way of both enhancing student provision and saving money. Overall a very information and interesting conference with lots of useful stuff to take away. You are currently browsing the e-Learning Stuff blog archives for June, 2010.